This article has new content coming soon from Hunt the Truth and Halo 5: Guardians, and may not be complete, confirmed or correct. Please update it as soon as any relevant and accurate material is available. "What a heinous, depressing rock. It's really no wonder why these people are so angry. They make camp on wasteworlds, I mean I'd be quite angry myself." Conrad's Point, also simply referred to as Conrad, is a remote human colony world. In 2558, a Forerunner Guardian construct awoke underneath a city on the planet, causing massive destruction as it launched. In 2558, a Forerunner Guardian was activated, causing large-scale destruction. Before the site could be secured by the Office of Naval Intelligence, the New Colonial Alliance took control of it. Not willing to let the Guardian fall into the NCA's hands, ONI tasked the operative Commander Maya Sankar to go undercover as the insurrectionist leader "FERO" and gather information by infiltrating the NCA, with the help of the AI Black-Box. 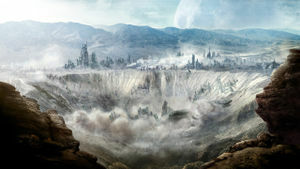 A city on Conrad's Point after being attacked by a Guardian.